Finally had a chance to photograph the fall colors in Colorado. 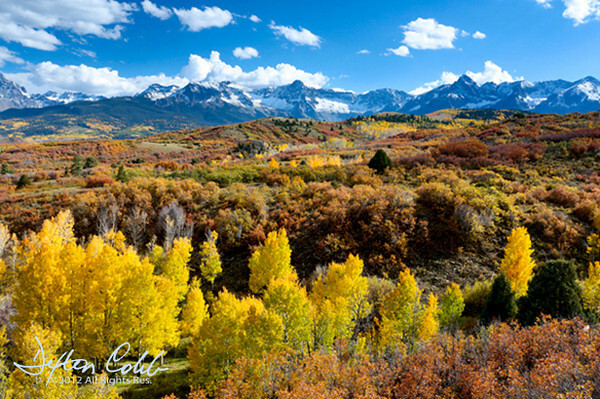 Casse and I spent the last week of September 2012 there with a few days in the Crested Butte area and a few days in the area not far from Ouray. Lovely colors in great abundance. Although I will say the reds in Northern Utah have a bit more punch to them. On our last day there we met a photographer from the bay area, didn’t get his name but I think it was Stephen Oachs, who advocated shooting midday. There he was at the Dallas Divide location waiting for clouds to blow into the scene so he could photograph at noon. This got me to thinking: Is it possible that landscape photographers, as a group, have gravitated to shooting in the golden hour to their detriment? I mean there have to be scenes that lend themselves better to mid-day light than evening light. Here is Mr. Oach's image taken there: http://www.stephenoachs.com/gallery-colorado.php . So here we are. This scene was photographed in what some would call harsh midday light. But actually, I’m quite pleased with it. It works for me probably because it is so different from the usual images made at this location. The colors seem to have much more impact in this light than in muted evening light and the sky is a wonderful shade of blue. A polarizer and 2 stop hard grad were used in this shot.